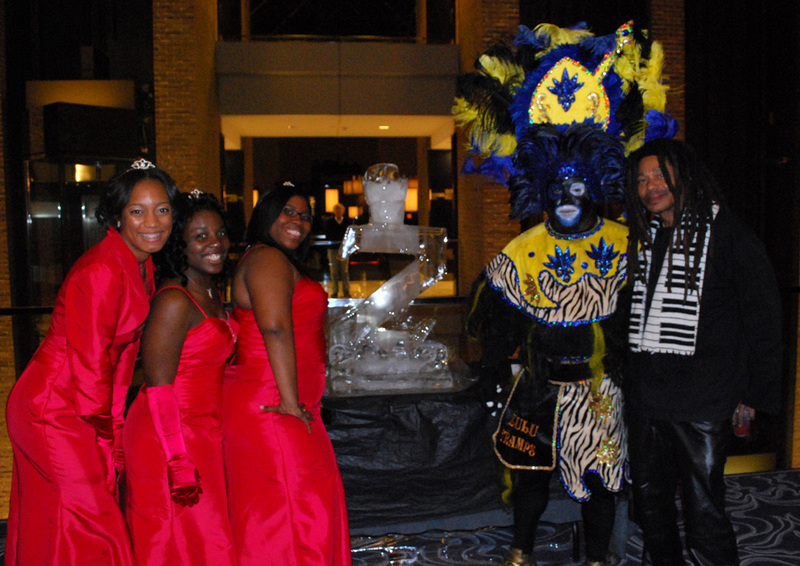 Chris Hunter (aka Mr.Jazzy) is an ice-sculptor with 35 years experience working for venues and events in New Orleans and Southern Louisiana. 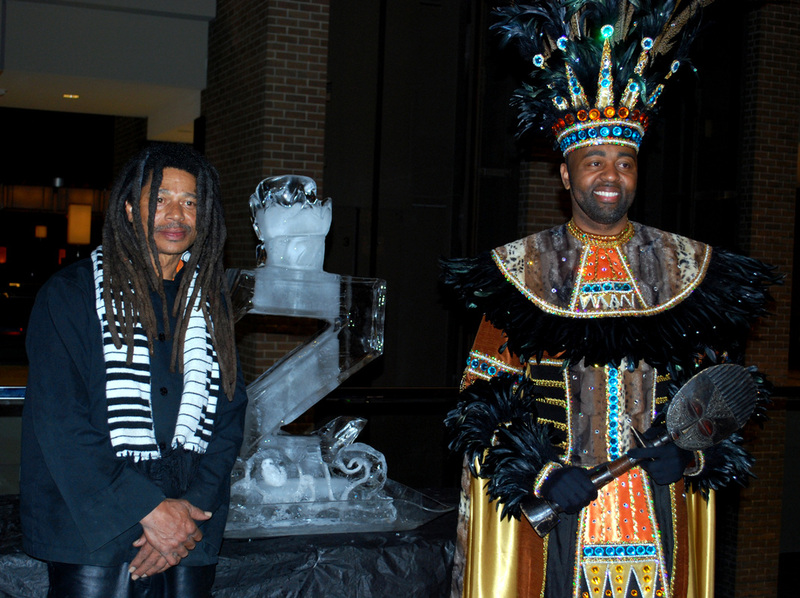 He carved his first ice sculpture in 1976, and has been a professional ice-carver ever since. "I am truly blessed to be able to make a living doing what I love!" - says Mr. Jazzy. 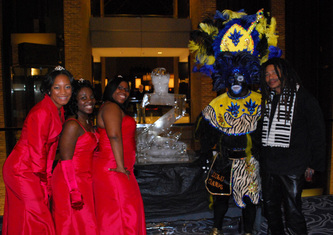 His sculptures decorated games and concerts in the Superdome, Grand Opening of the Armstrong Park, Mardi Gras Balls - Rex, Zulu, Endimion, Baccus, Thoth, Venus krewes, numerous weddings, parties and corporate events. He did ice carvings for the party in honor of President Jimmy Carter at the Superdome and Republican Convention in New Orleans where G.H. Bush Seniour was nominated to run for president. Mr.Jazzy did ice sculptures for parties for such celebreties as Tina Turner, Benny Goodman, Stevie Wonder, Prince, Muhhamed Ali. 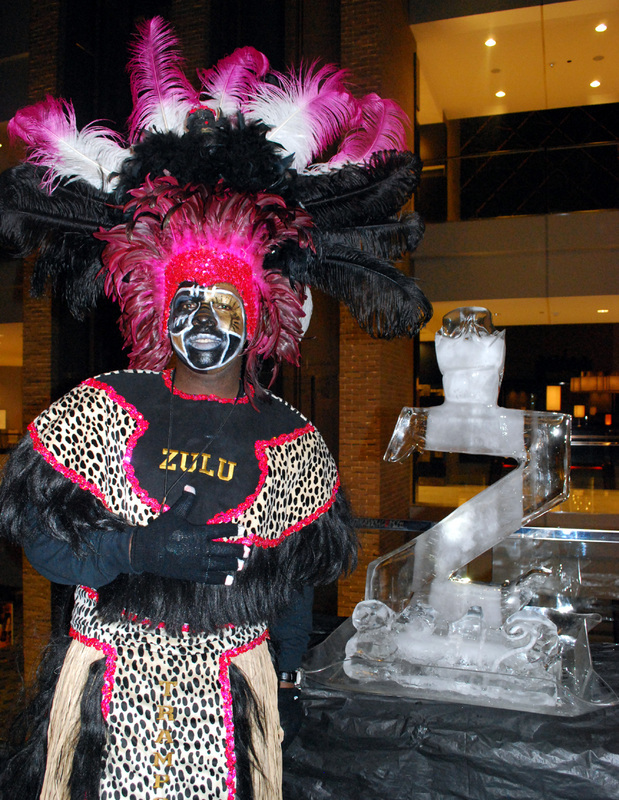 He lives in Gentilly and does ice carvings all over Louisiana and travels nationally for special events. 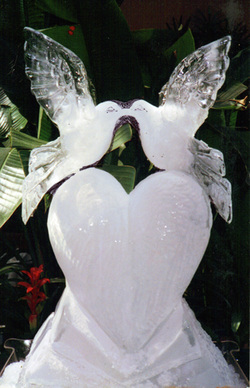 This is one of the most popular wedding pieces - a heart with doves. Sending you LOVE from Big Easy! Fleur-de-lis is the most popular item on his menu. They can be lit in gold or Mardi Gras colors - or any other color and can have all kinds of objects and lettering incorporated in the design. Mr.Jazzy was recently featured in AltVariety web-magazine, the Photoshop retouching on this picture is by their artists. 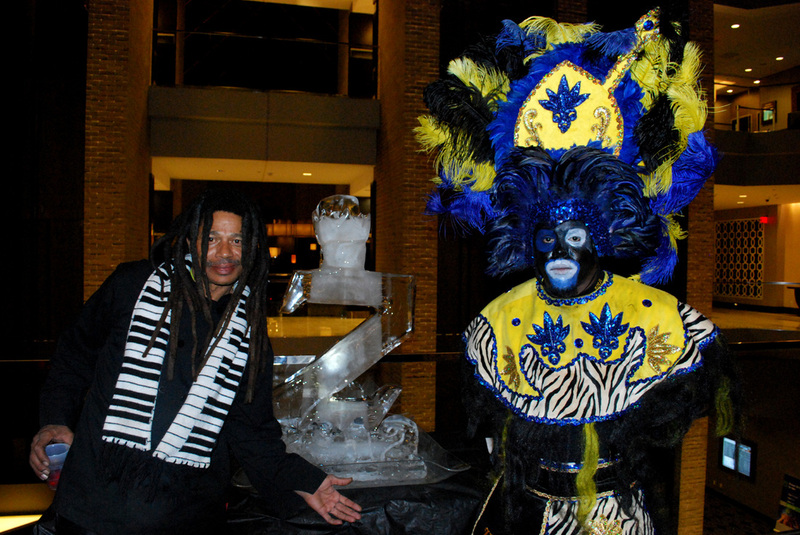 Chris Hunter was working with Krewe of Zulu for many years, creating decorations for their food tables. This is scull and bones with lettering for Witch Doctor's ball 2011. 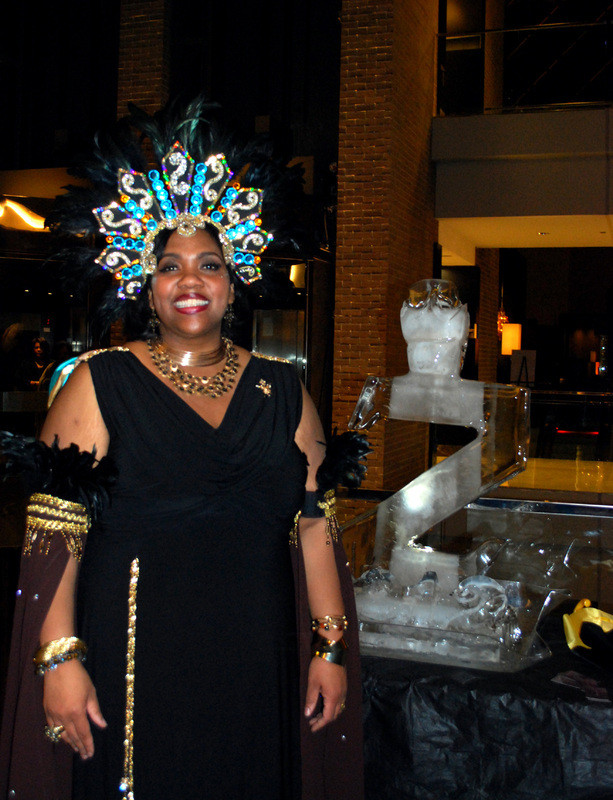 Centerpiece for the naming of the Rex King 1985 in Fairmont Hotel's Gold Room. 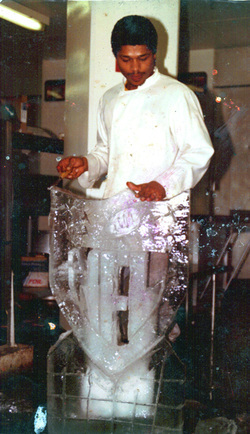 This is Chris with NFL ice sculpture for Superbowl in New Orleans in 1981 . This is another historic picture of Chris with a sculpture of NFL symbol for Superbowl 1981 in Louisiana Superdome , it was Chicago Bears versus New England Patriots. 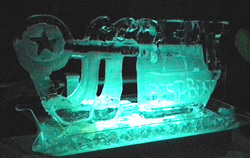 This carving was done in the Hyatt Regency Hotel for the NFL pre-game party and it was comissioned by NFL. The same year Chris won 3 gold medals for food sculptures made out of butter in the Culinary Arts competition held at the Hyatt Regency. Chris did 12 sculptures of local fish and wildlife for Haytt Regency Grand Opening in 1976, and he also carved famous jazz musicians statues for them. Mr.Jazzy also did a 12 foot dragon ice sculpture for Benny Goodman's party at the Hyatt Regency hotel same year. For more pictures, please, visit PHOTOS page. Booking details are on "Bookings" page. 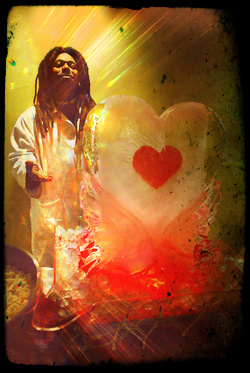 ONE LUV to the World! in Magnolia Country Club in New Orleans. 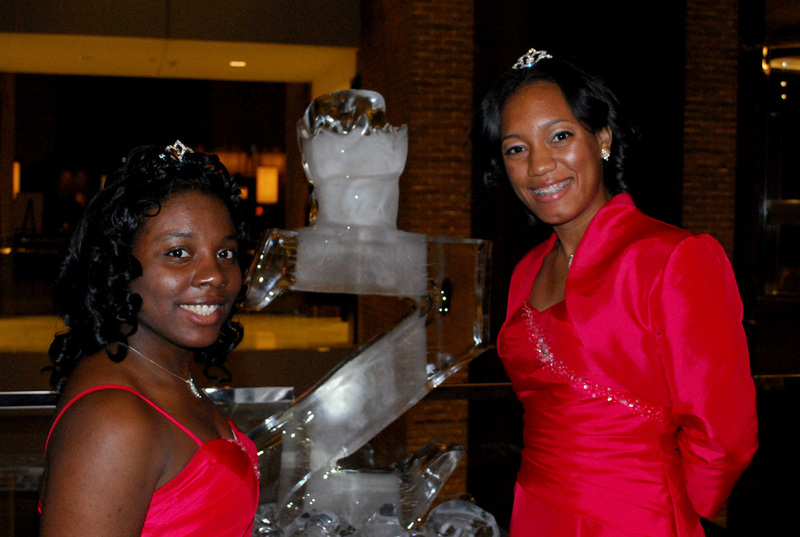 The luge is an ice sculpture with a vertical shaft drilled through the ice. This allows the drinks to be poured through it, and it chills the drinks. Chris retouching Happy New Year sculpture in Republic Club. 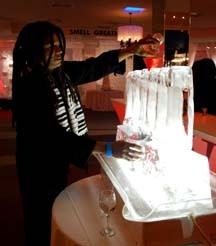 Chris made an ice sculpture for 2102 Best of the Beat music awards in Generations Hall. Chris did live ice carving for the Krewe of Zulu Lundi Gras celebration on the River. The video of this show is on youtube on Jazzy Ice channel. 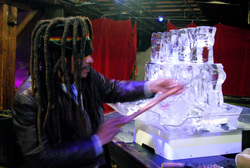 Chris was hired by New Orleans French Market to do ice carving demonstartion in the Jazz Alley. He invented and carved Tomato Gator - ice sculpture with an ice bowl for tomatos, French Market Arch, a shrimp and a pelican. It was raining a lot for both days, but the festival goes really loved the ice creations and took a lot of pictures.